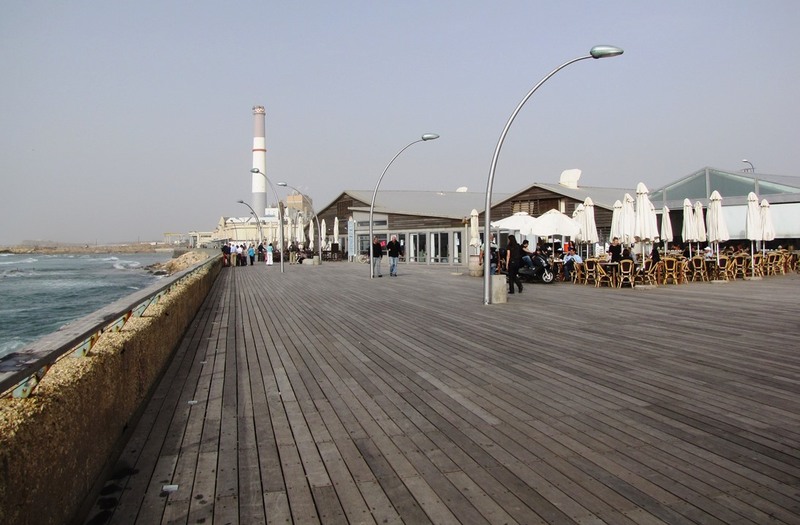 When I (Storm Cunningham) keynoted the Israel Planners Association annual conference in Jerusalem in 2009, the city planners of Tel Aviv took me on a tour of redevelopment and revitalization projects in their city. Old port transformed into public space. 2009 photo by Storm Cunningham. One project they were especially proud of was their recent transformation of an old industrial port area into a relaxing public space. Now, exactly a decade later, that redevelopment will be further revitalized. 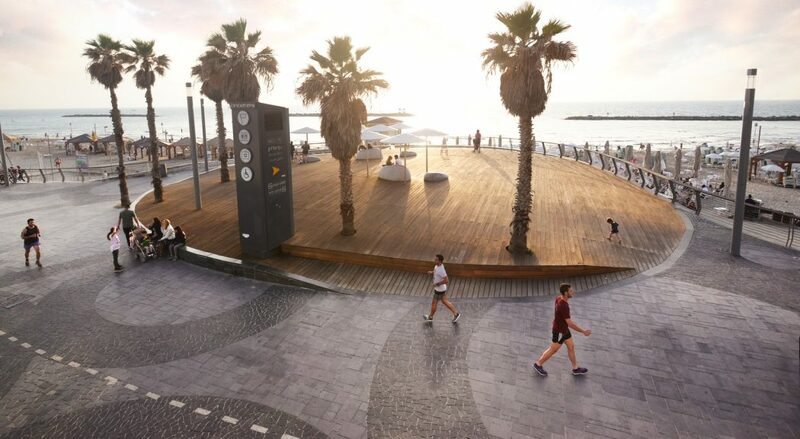 The Central Promenade of Tel Aviv’s beachfront has being beautifully redesigned by Mayslits Kassif Architects, and (I believe) extends all the way to revitalized port. This reconnection of the entire waterfront should have a hugely revitalizing impact. 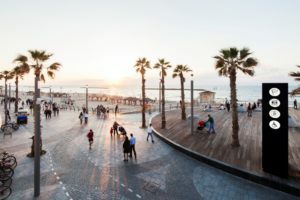 Since its inception in the late 1930s, the central promenade of the young Bauhaus city of Tel Aviv played a key role in establishing the ever-changing connection between the city and its shore. 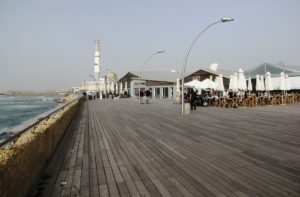 In all of the various phases of its life, the elevated boardwalk acted as a border between the city and its beach. 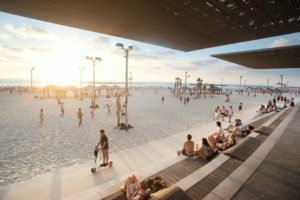 The current renovation project aimed to transform this historical blockade by creating a new continuous interface that enables free pedestrian flow to and from the sandy beach, throughout the city’s central waterfront. Moreover, serving as the main waterfront public space of the entire metropolitan area, the new promenade and its sitting-terraces were designed to offer a generous array of seats and relaxation opportunities along the seafront, in order to host a great many new visitors and create a hospitable and lively public domain for this large dense urban area. 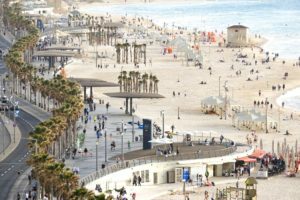 By creating a continuous stretch of sitting-stairs and ramps all along the waterfront, and redesigning the disused rooftops of the existing beach buildings and turning them into welcoming urban balconies, the physical rupture between the city and the sea was mended. 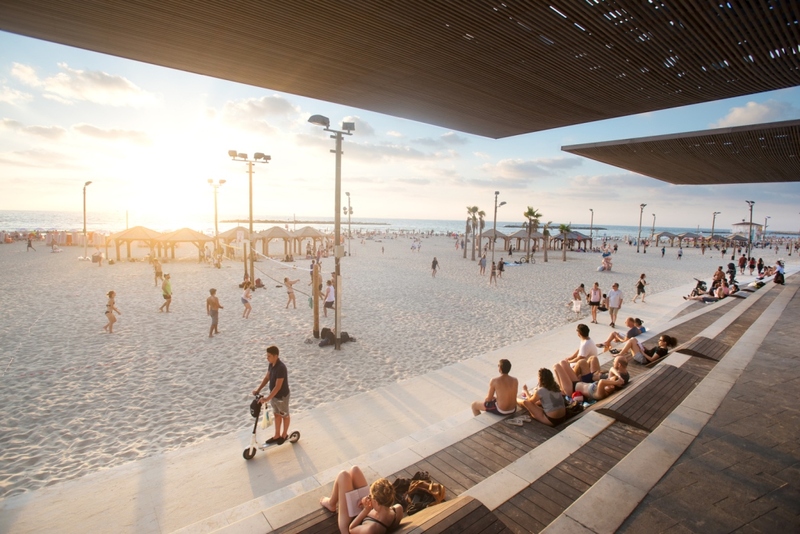 In order to create a sense of hospitality, the promenade was extended towards the beach with terraced sitting platforms and large shaded areas, as well as new recreational areas which hold sports facilities, various game courts, playgrounds and relaxation areas under the palms. By utilizing careful structural and detailed design, the project’s environmental footprint was minimized, accessibility in all aspects was achieved, and a liminal urban ‘new ground’ was created. 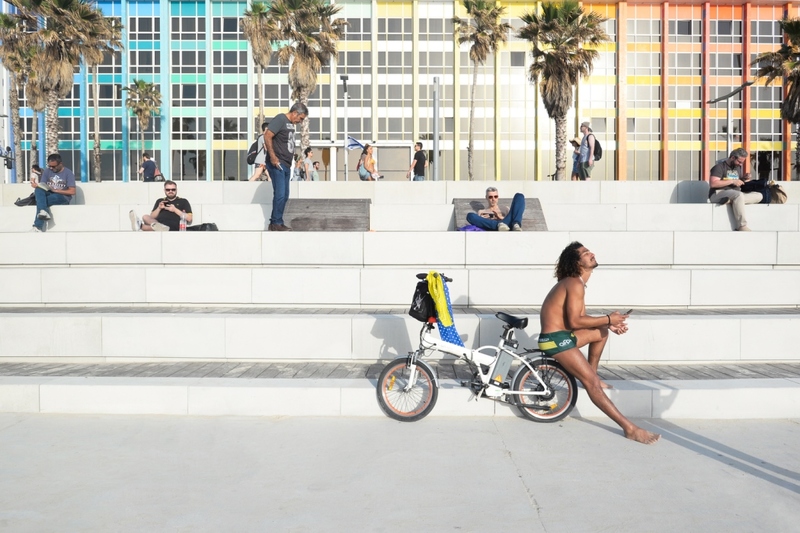 An in-between zone where swimsuits and business suits are mixed together in an urban space that doesn’t comply with any one code, it’s a unique design that is abstract and open to multiple interpretations, reflecting Tel Aviv’s unique urban character. Following other regeneration projects along Tel Aviv’s coastline, the newly renovated promenade is commonly considered the most transformative project among them, due to the radical change it made in the relation between the city’s built fabric and its primary natural resource – the sea. 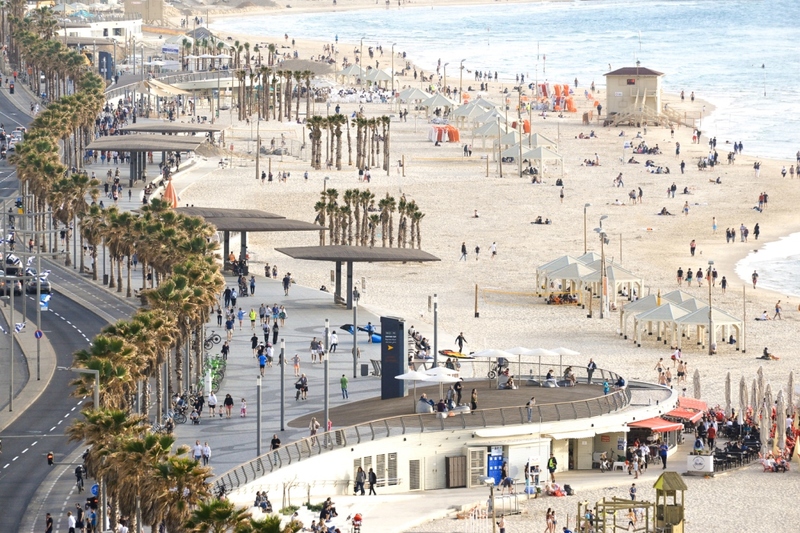 The new promenade is now host to over 9 million visitors a year, a record number compared to Israel’s population of only 9 million. 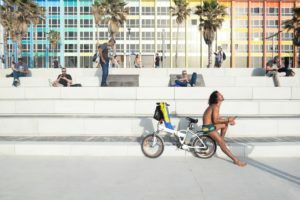 The new “in-between” space that was created in order to mediate between the city and its beach, had become a vital melting pot for a new urban culture, where spontaneous bands of acrobats, backgammon players, young parents, joggers and many more, turn the promenade into their common social-platform. Its generous amount of hospitable territory is open to all. It creates a highly multicultural and heterogeneous space intended to radiate a sense of free spirit and optimism into its dense and complex context. Unless otherwise credited, all images are courtesy of Guy Cohen, Aviad Bar-Ness and Elad Gonen. See Mayslits Kassif Architects website.